Mary Veronica Gauthier, better known by her stage name Mary Gauthier, is an American folk and country singer-songwriter. She was adopted from the very young age of one, but struggled with the idea of being adopted as she grew up. She ran way from home at fifteen, lived on friends couches and in halfway houses, and used drugs for many years. She almost completed a philosophy degree at Louisiana State University, but dropped out her senior year. She then opened and ran a Cajun restaurant for eleven years, which coincided with the birth of her interest in music and success at sobriety after an arrest for drunk driving on her restaurant opening night in 1990. Fast forward 28 years, 11 albums (8 studio albums) later and a lifetime of experience singing a combination of folk, Americana and country music and we land at Rifles & Rosary Beads. This is a collaborative album which was cowritten by Gauthier and members of the nonprofit, Songwriting with Soldiers, an organization that pairs veterans and active duty service members with professional musicians to tell their stories. Sometimes healing and sweet, other times sour and full of pain, this album is super powerful and deserves top marks for telling meaningful stories in a poetic way. I’ll admit I had not heard much of Gauthier’s catalogue prior to sitting down with this concept album, but gosh this just incredible to listen to, and I’m a sucker for this kind of music to begin with. Add in a favorable mix of genres, and you have timotheories gold. Starting off rather sober with the opening track, Soldiering On, this lyric I lifted from the song describes the tone well – what saves you in the battle, can kill you at home. Or better yet, how about this one from The War After the War – who’s gonna care for the ones who care for the ones who went to war. Gauthier is already a strong writer, but these are real stories we are hearing, featuring the voices of both the military types and their spouses, and all get credit in the liner notes. Brothers describes a viewpoint of military women looking for equality, whereas Bullet Holes in Sky offers mixed emotions about Veterans Day from a navy veteran. And we get the obvious question of circumstantial death in Still On The Ride because the loss of a friend in war is unshakeable and reverberates for a lifetime. 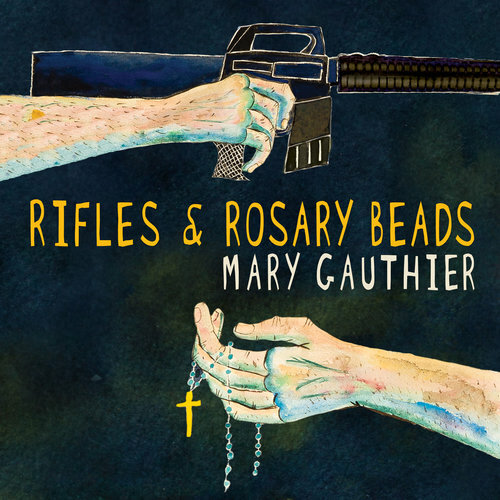 This is not easy listening, but that doesn’t mean it isn’t beautiful to behold and when layered with a great number of profound and heartfelt stories, Gauthier provides a chilling account of military service and how it impacts everyone in those peoples lives. This is an important album and filled with love. The two tracks which exemplify this notion of love best are It’s Her Love and closing track Stronger Together. Both are titled appropriately, with the first demonstrating the healing power of a support system, and the second about the significance of unity, leaving us with the notion that while military life can and sometimes does break us down, it’s through compassion and love that rebuilding happens. Pros: The authenticity behind the lyrics, and the compassion in the delivery are what drive this album forward and take it from a 7 to a 9. Cons: The fact that an album like this exists is an amazing thing, but where are the songs specifically calling out against sending people off to war with so much regularity? Points of Interest: Mary Gauthier is also an accomplished author, having had short stories published in the book Amplified, and a couple of magazines. Her songs are taught in universities and she is currently writing a book titled The Art of Songwriting. I’ve said this before, but I cannot stress enough the importance of listening to albums in full, and an album like Rifles & Rosary Beads demands attention, because these stories are what not only snapshots into individual lives, but excellent case studies for understanding the world around us better. Prioritizing the needs of those without a voice is such a folk music thing to do, as folk music typically stems from an oral tradition, without a producers voice or even better in a public domain. Now, this music wasn’t constructed in the back woods, but it absolutely is not commercial in nature or classic, and it’s brilliant. And on the subject of brilliance, Brendon and I have a review of the eponymous debut of alt rock group Weezer from 1994. This is a classic album, and one that also deserves some time and attention if you haven’t listened to it recently, or ever.